In the early part of the night a wombat grazes almost continuously, moving from tussock to tussock, sitting on its rump from time to time. Occasionally it pauses, head up, to listen and sniff the air, before lowering its head to graze again. After an hour or two, when its initial hunger is satisfied, it eats more sporadically, sits down more often and roams further between bouts of grazing. There is a great variety of ways in which a wombat passes the night, as so many factors can influence its activities. Usually it will stay above the ground, eating and travelling, for the entire night, but sometimes it will remain above ground for only three or four hours before retiring to a burrow, either for a rest or to do some housekeeping - cleaning out the tunnels or enlarging them. Then it emerges again to continue feeding, but it may disappear into another, or the same, burrow again later in the night. If it is disturbed in any way while it is above the ground, it will rapidly make for the nearest burrow, or a hollow log if there is no burrow handy, and dive into it. 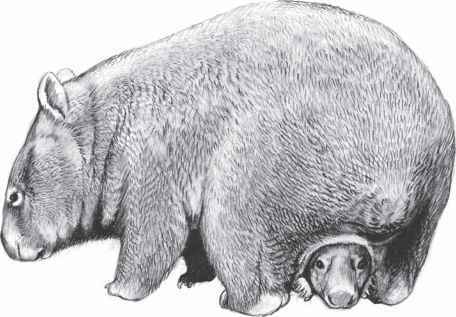 In this way a wombat may use three or four burrows in one night, and the burrow it finally enters for the next day's sleep may not be the one it left the previous evening.